Reprinted from an article by Lester Mark Haddad, M. D.
¿No estoy aquí, yo, que soy tu madre? Am I not the fountain of your joy? It is important to understand the historical background and setting at the time of the apparition to fully appreciate the impact of the Virgin of Guadalupe, La Morenita, as she is affectionally known to the Mexican people. Montezuma demanded heavy tribute from the surrounding Indian tribes, and was poised to conquer the few remaining regions of the dying Mayan civilization. Two gods important to understanding the events of history were Quetzelcoatl, the stone serpent, and Tonantzin, the mother god. Quetzelcoatl was the god who founded the Aztec nation, but left when human sacrifice began, as he was opposed to the terrible ritual; but he vowed to return one day to reclaim his throne and redeem the Aztecs in the year 1-Reed, which occurred every 52 years in the Aztec time cycle. Tonantzin was depicted as a terrifying figure, with her head comprised of snakes and her garment a mass of writhing serpents; her eyes projected fathomless grief. Tonantzin was worshipped at a stone temple in Tepeyac, about five miles from the capital Tenochtitlan. The European discovery of America by Christopher Columbus in 1492 led to the exploration and colonization of the entire Caribbean by the Spaniards. The Conquistadors, much like the Crusaders, were variably in search of fortune, personal glory, and God, and often all three. The expedition first went up the coast to Cempoala, where the heavily taxed tribe pledged their allegiance to Cortes. They continued through Jalapa, and headed towards Tlaxcala. They continued to find evidence of human sacrifice everywhere they went. This only strengthened their determination to stop the diabolic practice. At first the Tlaxcalans resisted the Spaniards. Cortes fought right alongside his men and forever earned their respect. Unable to defeat the Spaniards, the fierce Tlaxcalans finally joined forces with Cortes, and ultimately proved to be most valuable allies. 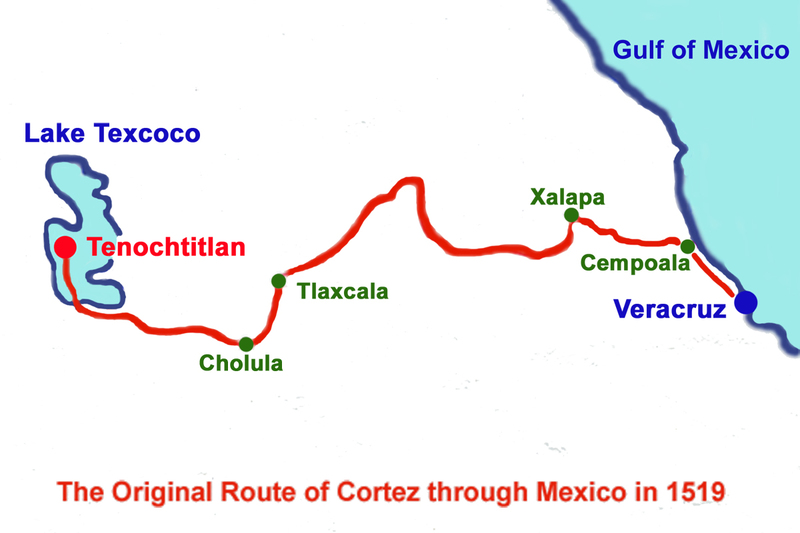 On the way to Tenochtitlan, Montezuma planned a trap in Cholula for Cortez, but the Spaniards and the Tlaxcalans overwhelmed the Chululan tribe, allies of the Mexica, and left 3000 dead. Montezuma recalled the dream of his sister when he learned that a black cross adorned the helmets of the Spaniards. Because he believed that he was the returning god Quetzelcoatl, Montezuma refused to attack Cortes, and actually welcomed him on his arrival into Tenochtitlan 8 November 1519, and housed the Spaniards in the palace of Montezuma's father. The Spaniards were appalled at the horrible spectacle of human sacrifice, and Cortez asked Montezuma to stop. But sacrifice of adults and even children continued, and the Spaniards were awakened each morning by the screams of sacrificial victims. Cortez boldly placed Montezuma under house arrest one week after his arrival, and confined him to his palace. Montezuma presented many gifts of gold, silver, and jewels to Cortez, but would not stop the demonic rituals. Finally, Cortes climbed the stairs of the main temple, had the priests remove the Aztec gods, and placed a Cross and image of the Blessed Virgin Mary. Father Olmedo said Holy Mass. The Aztec rituals stopped for three months. War was about to begin. Soon afterwards, Cortes had to leave the city for political reasons, and placed Pedro de Alvarado in charge of Tenochtitlan. During the festival of the sun god Huitzilopochtli in the spring of 1520, Alvarado decided to surround the Aztecs during their ritual ceremony in the temples, and slaughtered the unarmed celebrants. Outraged at this violation, the Mexica rose up in arms. Montezuma's brother Cuitlahuac assumed leadership and fiercely attacked the Spaniards. Montezuma died in the battle. Cortes returned to Tenochtitlan to find the city in open warfare. The Spaniards and Tlaxcalans were soundly defeated and driven from the city on the Night of Sorrow, June 30, 1520. Cortes' first action as conqueror was to place the region under the Spanish crown and demolish the temples of sacrifice and build Catholic churches in their place, such as the Church Santiago de Tlatelolco on the site of the Temple of the sun god in present-day Mexico City. Cortez did call for missionaries to convert the native Indians, and shortly after the Conquest, the Franciscan Peter Ghent from Belgium arrived in New Spain in August of 1523. He become known as Fray Pedro de Gante, and adopted the ways of the Indians and lived a life of poverty among the natives. He learned Nahuatl, the native Aztec language, and soon appreciated that communication with the natives was through images, music, and poetry. He first began to educate the young, and the natives soon learned to trust him and listen to the Christian message. In May of 1524, twelve Franciscan missionaries arrived, including Father Toribio Paredes de Benevente, who affectionally became known as Motolinia or "poor one" by the natives for his self-sacrificing ways. Many of the others attempted conversion by formal catechetical methods through translators. But they found the natives highly resistant to Christianity, the religion of the Conquistadors, who had killed thousands of Indians, raped their women, and destroyed Tenochtitlan. The Dominicans, including Father Bartolome de las Casas of the West Indies, the first priest ordained in the New World, the Augustinians, and the Jesuits arrived considerably later. In 1528 Charles V of Spain sent a group of five administrators known as the First Audience to govern Mexico. The First Audience was headed by Don Nune de Guzman, who quickly proved cruel and ruthless in his treatment of the native population. He forced the native population either to abandon their villages or be reduced to slavery, branded them on the faces, and sold them in exchange for cattle. To offset the First Audience, Charles V appointed Fray Juan Zumarraga as the first Bishop of Mexico City and Protector of the Indians in December of 1528. He accomplished much in his 25 years as Bishop, which included the establishment of the first grammar school, library, printing press, and the first college, Colegio de la Santa Cruz at Tlatelolco. However, he spent much of his first year in Mexico objecting to the ruthless treatment of the Indians by de Guzman, who by then had sold 15,000 Indians into slavery. The First Audience applied strict censorship, and forbade both Indians and Spaniards from bringing complaints to the Bishop. The Bishop countered with stern sermons against their use of military force, torture, and the imprisonment of Indians. Finally, in 1529, some Indians managed to smuggle a protest to Bishop Zumarraga concerning the heavy taxes and slave conditions in nearby Puebla. Bishop Zumarraga managed to send a message hidden in a crucifix back to Spain, and de Guzman was recalled. A Second Audience was appointed which proved judicial to the Indians, but did not arrive in Mexico until 1531. However, the Conquistadors and the First Audience had done grave damage to their relationship with the native population. The Indians were fed up with Spanish occupation, and resentment had reached a flash point. Isolated outbreaks of fights with the Spaniards had become inevitable, and Bishop Zumarraga feared a general insurrection. 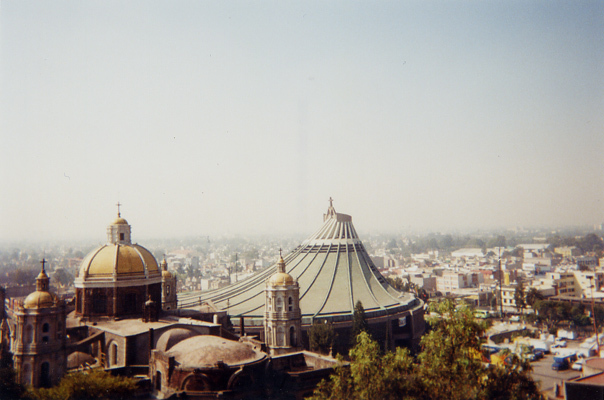 Such was the setting when the event of Tepeyac took place. The Aztec Indian Cuauhtlatoatzin, which means "the one who speaks like an eagle," was born in 1474. He married a girl named Malitzin, and they lived with an uncle near Lake Texcoco. The three were among the few to be baptized in the early days, most likely by Father Toribio in 1525, and given the names Juan Diego and Maria Lucia, and the uncle Juan Bernardino. Maria Lucia was childless, and died a premature death in 1529. Juan Diego Cuauhtlatoatzin was a widower at age 55, and turned his life to God. 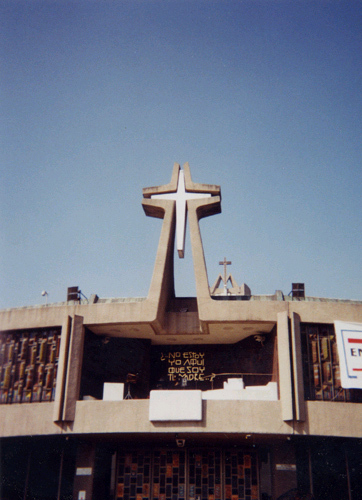 It was his custom to attend Mass and catechism lessons at the Church in Tlatelolco. At daybreak, on Saturday, December 9, 1531, Juan Diego began his journey to Church. As he passed a hill named Tepeyac, on which once stood a temple to the Aztec mother god Tonantzin, he heard songbirds burst into harmony. Music and songbirds presaged something divine for the Aztec. The music stopped as suddenly as it had begun. A beautiful girl with tan complexion and bathed in the golden beams of the sun called him by name in Náhuatl, his native language, "Juan Diego!" The girl said: "Dear little son, I love you. "I am the Virgin Mary, Mother of the one true God, of Him who gives life. He is Lord and Creator of heaven and of earth. give Him to all people through my love, my compassion, my help, and my protection. I shall take them all to my heart, and I shall cure their many sufferings, afflictions, and sorrows. So run now to Tenochtitlan and tell the Lord Bishop all that you have seen and heard." Juan Diego went to the palace of the Franciscan Don Fray Juan de Zumarraga, and after rude treatment by the servants, was granted an audience with the Bishop. The Bishop was cordial but hesitant on the first visit and said that he would consider the request of the Lady and politely invited Juan Diego to come visit again. Dismayed, Juan returned to the hill and found Mary waiting for him (second apparition). He asked her to send someone more suitable to deliver her message "for I am a nobody." She said on this second visit, "Listen, little son. There are many I could send. But you are the one I have chosen for this task. So, tomorrow morning, go back to the Bishop. Tell him it is the ever holy Virgin Mary, Mother of God who sends you, and repeat to him my great desire for a church in this place." So, Sunday morning, December 10, Juan Diego called again on the Bishop for the second time. Again with much difficulty, he was finally granted an audience. The Bishop was surprised to see him and told him to ask for a sign from the Lady. Juan Diego reported this to the Virgin (third apparition), and she told him to return the following morning for the sign. However, when Juan Diego returned home he found his uncle Juan Bernardino gravely ill. Instead of going back to Tepeyac, he stayed home with his dying uncle on Monday. Juan Diego woke up early Tuesday morning, December 12th, to bring a priest from the Church of Santiago at Tlatelolco, so that his uncle might receive the last blessing. Juan had to pass Tepeyac hill to get to the priest. Instead of the usual route by the west side of the hill, he went around the east side to avoid the Lady. Guess who descended the hill on the east side to intercept his route! The Virgin said, "Least of my sons, what is the matter?" Juan was embarrassed by her presence (fourth apparition). "My Lady, why are you up so early? Are you well? Forgive me. My uncle is dying and desires me to find a priest for the Sacraments. It was no empty promise I made to you yesterday morning. But my uncle fell ill."
Mary said, "My little son. Do not be distressed and afraid. Are you not in the fold of my mantle, in the cradle of my arms? Your uncle will not die at this time. This very moment his health is restored. There is no reason now for your errand, so you can peacefully attend to mine. Go up to the top of the hill; cut the flowers that are growing there and bring them to me." Flowers in December? Impossible, thought Juan Diego. But he was obedient, and sure enough found beautiful Castilian roses on the hilltop. As he cut them, he decided the best way to protect them against the cold was to cradle them in his tilma - a long, cloth cape worn by the Aztecs, and often looped up as a carryall. He ran back to Mary and she rearranged the roses and tied the lower corners of the tilma behind his neck so that nothing would spill, and said, "You see, little son, this is the sign I am sending to the Bishop. Tell him that now he has his sign, he should build the temple I desire in this place. Do not let anyone but him see what you are carrying. Hold both sides until you are in his presence and tell him how I intercepted you on your way to fetch a priest to give the Last Sacraments to your uncle, how I assured you he was perfectly healed and sent you up to cut these roses, and myself arranged them like this. Remember, little son, that you are my trusted ambassador, and this time the Bishop will believe all that you tell him." This fourth apparition was the last known time Juan Diego ever saw the Virgin Mary. Juan called for the third time on the Bishop and explained all that had passed. Then Juan put up both hands and untied the corners of crude cloth behind his neck. The looped-up fold of the tilma fell; the flowers he thought were the precious sign tumbled out on the floor. The Bishop rose from his chair and fell on his knees in adoration before the tilma, as well as everyone else in the room. 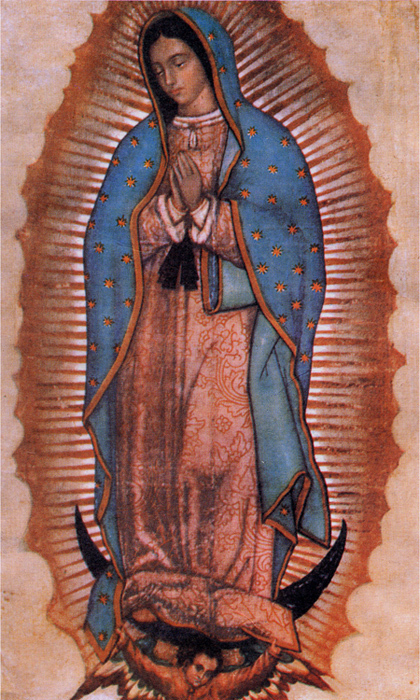 For on the tilma was the image of the Blessed Virgin Mary just as described by Juan Diego. While Juan Diego was calling on the Bishop, Juan Bernardino, the dying uncle, suddenly found his room filled with a soft light. A luminous young woman filled with love was standing there and told him he would get well. During this fifth apparition, she told him that she had sent his nephew, Juan Diego, to the Bishop with an image of herself and said, "Call me and call my image Our Lady of Guadalupe." 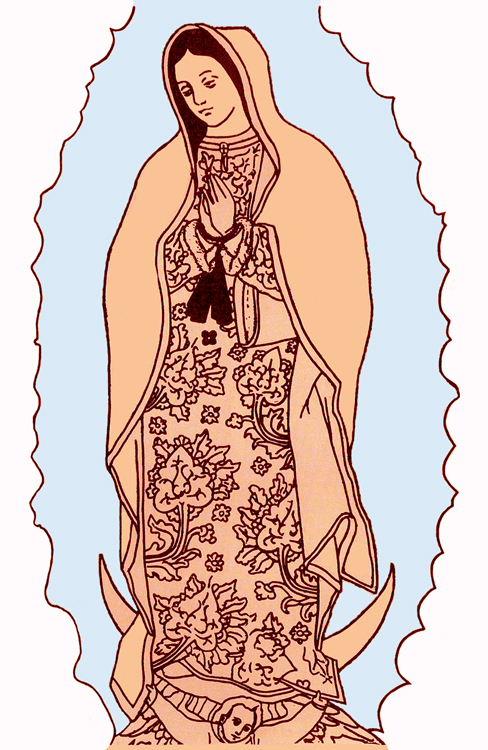 The imprint of Mary on the tilma is striking, and the symbolism was primarily directed to Juan Diego and the Aztecs. Mary appears as a beautiful young Indian maiden with a look of love, compassion, and humility, her hands folded in prayer in reference to the Almighty God. Her rose dress, adorned with a jasmine flower, eight petal flowers, and nine heart flowers symbolic to the Aztec culture, is that of an Aztec princess. Her blue mantle symbolized the royalty of the gods, and the blue color symbolized life and unity. The stars on the mantle signified the beginning of a new civilization. La Morenita appeared on the day of the winter solstice, considered the day of the sun's birth; the Virgin's mantle accurately represents the 1531 winter solstice! Mary stands in front of and hides the sun, but the rays of the sun still appear around her, signifying she is greater than the sun god, the greatest of the native divinities, but the rays of the sun still bring light. 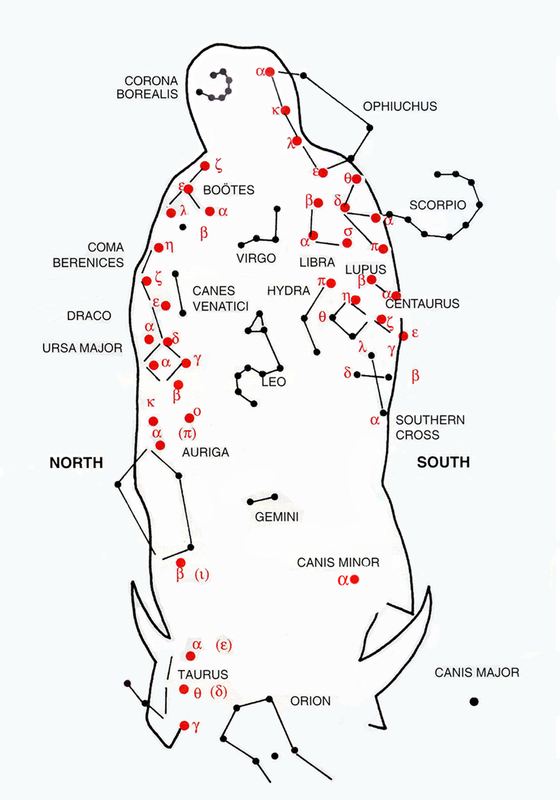 Twelve rays of the sun surround her face and head. She stands on the moon, supported by an angel with wings like an eagle: to the Aztec, this indicated her superiority to the moon god, the god of night, and her divine, regal nature. and on her head a crown of twelve stars." Bishop Zumarraga was overwhelmed by the miracle of the tilma, and this time extended his hospitality to Juan Diego and invited him to spend the night. He gently removed the tilma and placed it in his private chapel, where all prayed in thanksgiving for the miracle. The following day, they set out for Tepeyac, and Juan Diego showed Bishop Zumarraga where Mary had appeared. The Bishop directed that a small chapel be erected at the site. The enthusiasm from the event produced so many volunteers that a chapel in Tepeyac was constructed by Christmas Day. Juan Diego then asked leave of the Bishop that he might see his uncle. The Bishop insisted that Juan Diego be escorted back to his home and then returned to his palace. Juan Diego and Juan Bernardino were joyfully reunited, and both recounted to each other the miraculous events. Juan Diego brought his uncle back to the Bishop's residence to show him the tilma, and they stayed as guests of the Bishop until Christmas. The convergence of the curious multitude led the Bishop to move the tilma to the Cathedral so that all could marvel and pray. On December 26, 1531, a solemn procession with the Bishop, Juan Diego, Franciscan priests, and the faithful brought the tilma from the Cathedral to the Chapel at Tepeyac. Thousands attended the procession. In the excitement, some Indians shot arrows into the air, and one mortally wounded a man in the procession. A priest tended to the wound, and prayers were said to the Virgin, and the man was reported to have been miraculously healed. This only added to the fervor of the procession. Juan Diego lived in a hermitage built for him next to the chapel at Tepeyac, and showed the tilma and explained the apparition and its Christian significance over and over to pilgrims who visited the shrine. He died peacefully on May 30, 1548 and was buried at Tepeyac. Bishop Zumarraga died only three days after Juan Diego. On November 14, 1921, during a period of government persecution, a powerful bomb hidden in flowers exploded directly underneath the tilma during High Mass, and destroyed stone and marble in the sanctuary and shattered the stained-glass windows of the Basilica. When the smoke cleared, the congregation was amazed to find that the tilma remained untouched, and the thin protective glass covering was not even cracked, nor was anyone hurt. Scientific studies of the tilma have been undertaken through the years, which have only served to confirm its supernatural nature. The tilma remains just as vibrant as ever, having never faded. Famous Mexican artists such as Miguel Cabrera (1695-1768) determined that it is impossible for the rough surface of the tilma to support any form of painting. Furthermore, the tilma appeared to embody four different kinds of painting, oil, tempura, watercolor, and fresco, blended in an inexplicable fashion. One of the unusual characteristics of the tilma is that up close the features are unremarkable, but the tone and depth emerge beyond six or seven feet and the image becomes more radiant and photogenic. How did Our Lady identify herself? Bishop Zumarraga understood the Spanish name Guadalupe, a Marian shrine in Estremadura, Spain. But Mary spoke Nahuatl to Juan Diego, and some writers suggest that she may have said Coatlaxopeuh or one "who treads on the snake," recalling Genesis 3:15. On the other hand, Juan Gonzalez, the interpreter present for conversations between Juan Diego, his uncle, and the Bishop, was reported to be fluent in both Nahuatl and Spanish, so any misinterpretation would seem unlikely.2, 4 Either may be possible, as Mary is our Mother (John 19:25-27) everywhere. The tilma of Juan Diego is the only known divine image of the Blessed Virgin Mary that exists on our planet! Popes through the ages have recognized Our Lady of Guadalupe, and Pope John XXIII was the first to call the Virgin Mother of the Americas on October 12, 1961. John Paul II was the first Pope to visit the Guadalupe shrine on January 27, 1979. On January 23, 1999, Pope John Paul II, referring to all of the Americas as one single continent, called the Virgin of Guadalupe the Mother of America. Pope John Paul II canonized Juan Diego a Saint on July 31, 2002. Juan Diego certainly deserves sainthood, as he was both humble and obedient to the request of Our Lady. The Catholic Church remains firmly entrenched in Mexico, Central and South America, which today are at least 90% Catholic. The Catholic Church of the United States with 60 million Catholics can attribute much of our recent growth to the Hispanic population of North America. I write this from Mexico City during the Feast Day of Our Lady of Guadalupe. 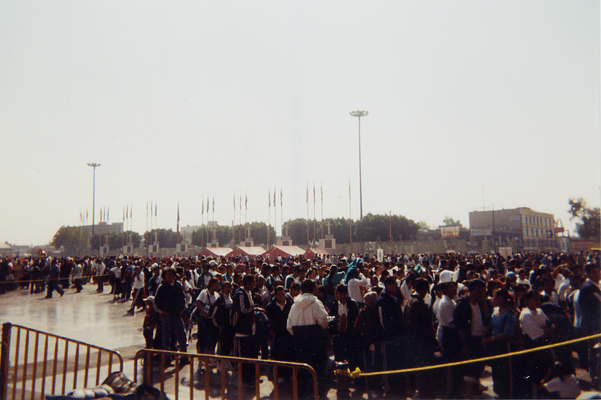 The Mexico Herald reports that a crowd of 5 million has come to honor the Blessed Virgin Mary in Tepeyac, now La Villa, Mexico City. The square in front of the Basilica is filled with families waiting to attend Mass and to see the tilma of St. Juan Diego. The beautiful new Basilica, which holds 10,000 people, was completed in 1976. I am struck by the faith of the Mexican people. Some are walking on their knees, some circle in native dances. Some have travelled for three days and have camped out in front of the Church. They line up in front of the escalators that go underneath the tilma behind the main altar. They pray and cry in front of the beautiful relic of the Virgin that visited their land 472 years ago. I look up and am struck by the natural beauty and colors of the Virgin's dress. How can the tilma be so bright but so old?! The paintings in the nearby museum are only 150 years old but are dark and faded. The Mass of the Roses blends all of the Mexican cultures - Indian, Criollo, and Mestizo. The music is interspersed with the beat of native drums and dancing. The crucified Jesus hangs alone on his cross above the main altar, which is elevated on a platform. Behind the altar to the right is the tilma of the Virgin, underneath a large cross on the wall. The aroma of roses fills the air. Love and tears fill the faces of the people. Our Lady of Guadalupe, Patroness of the Americas, please pray for us. 1 Testoni, Manuela. Our Lady of Guadalupe - History and Meaning of the Apparitions . St. Paul - Alba House, Staten Island, New York, 2001. 2 Johnston, Francis. The Wonders of Guadalupe, or El Milagro de Guadalupe . Tan Books and Publishers, Rockford, Illinois, 1981, 1996 (Spanish). 3 Demarest D, Taylor C. The Dark Virgin - The Book of Our Lady of Guadalupe . Coley Taylor Publishers, Freeport, Maine, 1956. 4 Carroll, Warren H. Our Lady of Guadalupe and the Conquest of Darkness. Christendom Press, Front Royal, Virginia, 2002. 5 Boone, Elizabeth. The Aztec World. St. Remy Press and the Smithsonian Institution Books, Washington, D. C., 1994. 6 Krauze, Enrique. Mexico - Biography of Power . Harper-Collins Publishers, New York, 1997. 7 Elizondo, Father Virgilio. La Morenita - Evangelizer of the Americas . Mexican American Cultural Center, San Antonio, Texas, 1980. 8 Berkin C, Miller CL, Cherny RW, Gormly JL. Making America, Fourth Edition. Houghton Mifflin Company, Boston, 2007. 9 Schreck, Alan. Historical Foundations. Franciscan University, Steubenville, Ohio, 2003. 10 Anderson, Carl and Monsignor Eduardo Chavez. Our Lady of Guadalupe - Mother of the Civilization of Love. Doubleday, New York, 2009. 11 Rengers, Christopher OFM. Mary of the Americas . St. Paul - Alba House, Staten Island, New York, 1989. 12 Navarre RSV Bible. Four Courts Press, Dublin, Ireland, 2005.